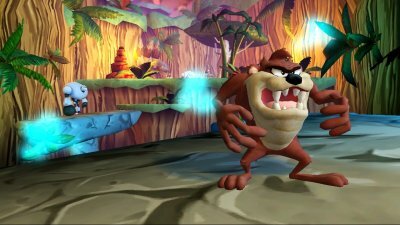 Those whacky Looney Tunes characters are back in the console world in their latest incarnation called "Looney Tunes ACME Arsenal" which is available on PlayStation 2 (review), WII and XBox 360. When the bizarre and dangerous Doctor Frankenbeans vows revenge on the characters of Looney Tunes, he creates a nefarious plot to go back in time and destroy their ancestors. It's up to Bugs Bunny, Marvin Martian, Daffy Duck, Duck Dodgers, The Tasmanian Devil, Foghorn Leghorn, Big Furry Green Bugs and Wile E. Coyote to save their world and existence from the insidious Doctor Frankenbeans. Although Looney Tunes ACME Arsenal is your traditional 3D arcade platformer, gamers can also access different vehicles and also switch between characters which also offers multiplayer play and access to a variety of weapons and powerups. Unfortunately for our heroes, they must also challenge a wide variety of foes that have been thrown at them by Doctor Frankenbeans. 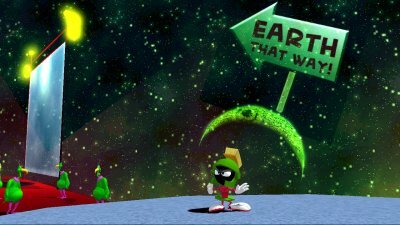 The developers have ensured that the gameplay doesn't become stagnant by recreating a wide variety of classic Looney Tune environments and moments as gamers visit Mars, travel back in time and also meet a wide variety of other Looney Tune characters, all while saving the world. Unfortunately for our heroes, they must also challenge a wide variety of foes that have been thrown at them by Doctor Frankenbeans. The developers have also attempted with a variety of different quests to ensure that the gameplay doesn't become stagnant by recreating a wide variety of classic Looney Tune environments and moments as gamers visit Mars, travel back in time and also meet a wide variety of other Looney Tune characters, all while saving the world. The control system of Looney Tunes ACME Arsenal has been perfectly mapped on the PlayStation 2 controller and the game has a true Ratchet & Clank feel to it as gamers must control their characters into vast and wondrous 3D worlds by running, jumping and defeating a variety of enemies. There are also a variety of different ACME weapons available for your characters which makes thing quite entertaining and you blast your foes into the netherworld. 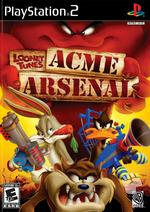 Graphically, Looney Tunes ACME Arsenal looks almost like the real cartoon series as all the characters have been faithfully recreated, even some of the famous Looney Tunes environments. 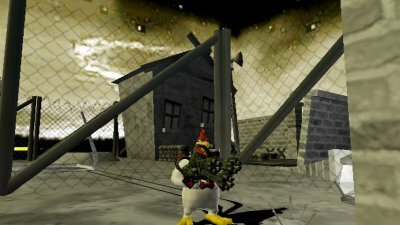 The developers make good use of lighting and shadow techniques and match that with some great special effects and you are in cartoon heaven. The only downside of the title is the annoying camera angles which does hamper the gameplay at key scenes in the game. The developers also add some great pre-rendered cutscenes between the levels which is oozing with CGI candy. The music and voices are also borrowed from the original cartoon series, although some character do sound a little out of place but it's still a great interpretation of the originals. In conclusion, most gamers should be able to complete this title in around 8 - 10 hours as the title contains 10 missions. Probably more aimed at the younger gaming market, those that enjoyed the Ratchet & Clank series will probably enjoy this version on the PlayStation 2. Definitely worth a look!